MILAN – The Serie A 2010/11 Week 26 match between Inter and Cagliari was settled by Andrea Ranocchia, who celebrated his first goal in Nerazzurri colours when he got a touch on Kharja's shot just yards from goal. 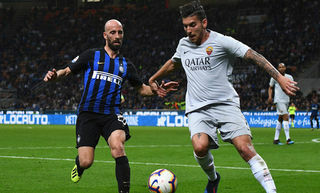 In a game that started brightly and gradually petered out, it was enough to earn Inter all 3 points. FIRST HALF – Leonardo decided to freshen things up in midfield, with Cambiasso and Stankovic dropping to the bench. 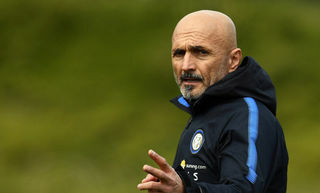 The coach also switched to a 4-2-3-1 formation: Zanetti and Thiago Motta began in front of the defence while Pandev, Kharja and Eto'o lined up behind Pazzini, who took on the role of lone striker. Nagatomo made his second consecutive start at left-back. Cagliari went with Cossu in the hole behind Nenè and Acquafresca. The game got off to a lively start with chances for both sides. Pandev began the game with intent and hit two shots on target within the first five minutes, Agazzi palming the first past his right-hand upright and touching the second wide of the left post. Cagliari didn't take long to respond: from a corner Julio Cesar had to be alert to tip Conti's header over. The Nerazzurri found an opener after 7 minutes: a quick freekick was played to Kharja inside the box and he had time to control and hit a firm effort at goal; Agazzi saved and the Moroccan got a another bite of the cherry; his second effort was heading for the net anyway but took a deflection off Ranocchia on the line, who thus unintentionally grabbed the glory. Cagliari got straight back at Inter from the restart, though, as Biondini tested Julio Cesar. In the 21st minute, Eto's low shot on the turn was smothered by Agazzi. Down the other end, shortly before half time, Nagatomo had to be quick to slide in ahead of Acquafresca, with the frontman about to pull the trigger. After a minute's stoppage time, the first half ended 1-0. SECOND HALF – The second half began with the same 22 players. Conti tried to release Acquafresca with a dangerous-looking ball on 54 minutes but Cordoba was on hand to make a timely intervention. On the hour Stankovic came on to replace Eto'o, Leonardo opting to give the Cameroonian a breather in view of Wednesday's game against Bayern Munich. 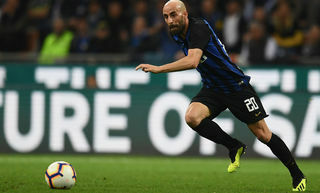 In the 66th minute Canini made a crucial challenge on Pazzini as the Inter striker tried to free himself for a shot inside the box. The San Siro then breathed a sigh of relief when Conti's shot took a wicked deflection and bounced inches wide of the post. 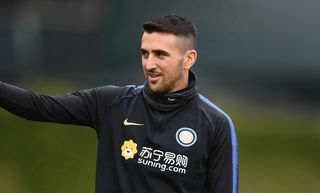 Inter came under pressure again 5 minutes later: after blocking several Cagliari shots inside the box, the Nerazzurri Inter defence cleared their lines as far as Lazzari, who fired just wide. As the game drew on, and with the Champions League in mind, Leonardo also summoned Thiago Motta and Kharja back to the bench but the referee was in no hurry to end the game, as he awarded 5 minutes of stoppage time. After 95 minutes, Inter v Cagliari ended 1-0 thanks to Ranocchia's early deflected goal. The result takes the Nerazzurri up to 50 points in second, two behind AC Milan, awaiting the results from tomorrow's games. 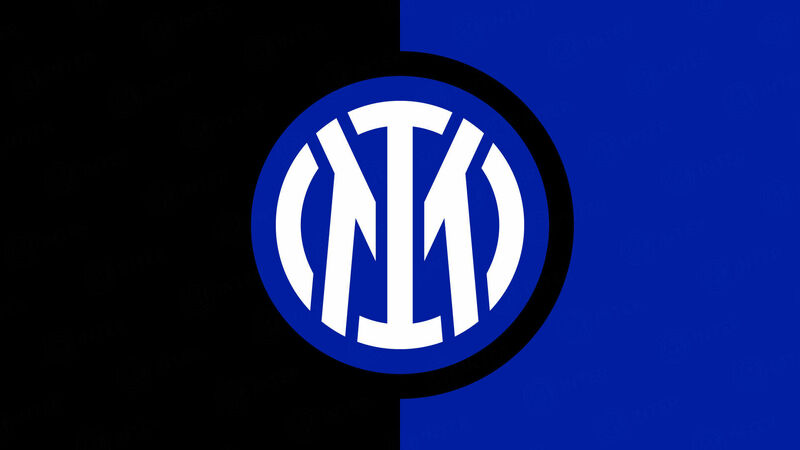 Inter: 1 Julio Cesar; 13 Maicon, 15 Ranocchia, 2 Cordoba, 55 Nagatomo; 4 Zanetti, 8 Thiago Motta (19 Cambiasso, 72); 27 Pandev, 14 Kharja (17 Mariga, 78), 9 Eto'o (5 Stankovic, 61); 7 Pazzini. Unused subs: 12 Castellazzi, 20 Obi, 23 Materazzi, 29 Coutinho. Cagliari: 1 Agazzi; 14 Pisano, 13 Astori, 21 Canini, 31 Agostini; 8 Biondini, 5 Conti, 10 Lazzari; 7 Cossu (4 Nainggolan, 70); 18 Nené, 9 Acquafresca (30 Ragatzu, 64). Unused subs: 25 Pelizzoli, 3 Ariaudo, 20 Laner, 23 Missiroli, 24 Perico. Booked: 7 Cossu, 90+1 Mariga, 90+4 Maicon. Maicon: "An important three points"